With content, less can be more if you ask Daniel Daines-Hutt, as long as the content that you are putting out is of the highest quality and has proven it has what it takes to get attention and convert customers. He has proven that by writing far less often than most industry experts generally swear by, you can actually get more traffic and higher conversions. But just as important as the content you’re putting out there is how you’re promoting it. The way you target and test your content will directly impact how much you’re paying for your ads and how that relates to the lifetime value of your average customer. Rich: He’s a self confessed marketing nerd, who has a background in direct response advertising, but ironically, it’s his content marketing that people know him for. He had the Top 10 content of all time on inbound.org, and Top Content of 2017 and 2018 on Growth Hackers. He also had a viral post that generated $3 million in client requests in just 2 weeks. He teaches people how to write less often but get more traffic at ampmycontent.com. 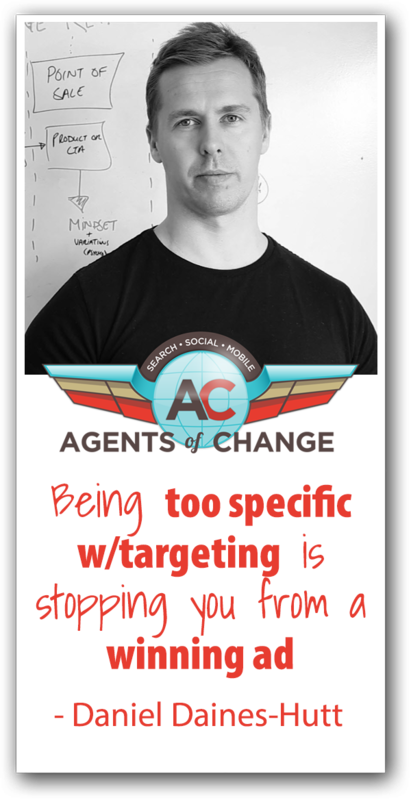 But no need to go there right now, because he’s right here in The Agents of Change Podcast. Daniel Daines-Hutt, welcome to the show. Daniel: Woo! Thank you so much for having me. Rich: I’m glad to have you on here. So you got started in direct response advertising but you came over to content marketing. How did you make the switch? Daniel: It’s a bit of a weird story. I’m an Englishman living in New Zealand, myself and my partner. We were going to get kicked out of the country because we couldn’t apply for a new visa, I was too old, basically. Long story short, I created a clothing company that did really well, in 5 weeks were were in 5 retail stores. From that you start advertising your own business doing paid ads and SEO and things like that. And when I really got into direct response I was a bit of a nerd, I really liked the psychology aspect and also I was an engineer by trade originally so I liked the numbers aspect, getting an actual result. So I treat my content a lot like that. And so we end up creating very effective content. I got a lot of requests from people to teach and show how to do that, and so I built out my content with my partner, Freya. Freya is a classic writer, she’s very introverted, it’s hard to get her on these things. But that’s the long and short of it. Rich: Alright. Well content marketing is basically a hot topic these days, and as more people get into content marketing, it feels like the bar for creating quality content and getting that content seen by our ideal customers has gotten increasingly tougher. So what are some of the things that you’re doing these days to amp your own content? Daniel: So a big thing for me – like I said, I’m a nerd – so I look at the systems and what the systems are trying to create. And with RankBrain and SEO and all these things you can see that a lot of people are actually trying to create an experience of better content. Basically they want users to have the best experience. But the good thing about that, it means if you focus on creating content like that – more in depth, higher value – you can write less often. So I only have actually written 9 blog posts in 2 years now. And yet we have all those results. So when you write less often you can write good content. But you do need to promote it and get it out to people. So right now a big focus of ours is paid promotion. So we just wrote a huge guide to this. But basically for every dollar we spend and advertising our article to new people, we make $22 in return. Rich: Alright. And I definitely want to get to how you figure out that ROI. But I just want to make sure I understand. So you’re writing less than a lot of people think that you need to write. But are you writing longer posts? I mean, you mentioned promotion is part of it, but what makes this content more valuable in the first place? Because I’m sure just throwing money behind mediocre content is not going to succeed. Daniel: Yeah, it’s not going to help. So a big thing is obviously the content has to be good, and it has to convert. So every piece of content that we create is also going to collect emails. So our business system is to ready our content and become a subscriber, and eventually via email they’re made offers. So that’s how we figure out how much a subscriber is worth and how we figure out ROI as well. Rich: So how do you get started? So if somebody is listening to this right now and they’re like, “I definitely want to get more people looking at my content”, what are some of the first steps that they should take? Daniel: They definitely need to improve the content usually. Because let’s say before you run any paid ads, if you’ve got an article the first thing I recommend id to improve the content you already have. Because if it’s something you’ve already got traffic, it’s much easier to improve that and then get it out in front of more people. That makes sense, right? Daniel: So we actually wrote a guide on this. It’s not that difficult to do. So I listen to a lot of people who are smarter to me. Jonah Berger wrote a book called, Contagious, it’s why things go viral, why human beings in society share things and stuff like that. And if we look at Buzzsumo’s post where they looked at a million websites and their ranking profiles and why certain things ranked and why things didn’t, we took an overlap between those two things to see what makes stuff go viral and why stuff ranks. And it’s content that has authority, that people trust you, which is huge online. You can’t sell anything in person without trust, right? It’s even more so online where there’s this disconnect because people can just turn their computer off. It’s content that has value, it’s content that builds reciprocity. If we break it down even further it’s content that’s long form and 3,000-5,000 words. That’s not huge. Content that’s actionable. So rather than just saying to someone, “You need to do this”, show them how to do it as well. Suddenly it becomes a valuable asset to them. The beauty of that is influencers you want to link to resources and things, they’re more likely to link to you also. So not only are you getting better results, building more trust from your readers, you’re also appealing to people who can help you rank. So it’s not that difficult, just taking certina boxes basically. Rich: Ok, so let’s say we’ve taken those boxes. We found a post that maybe we’re getting some traffic to, we can improve it maybe by adding some more content to it, maybe putting some quotes in there, some numbers, some charts, whatever it is. Now we’ve got an article that we think is really good. So what would be the next steps to get more eyeballs on it? Daniel: One last thing as well, is that content needs to have a call to action to convert, basically. Because a lot of people are putting content out there that attracts people, SEO and all things like this social, but there’s no action to take and so it’s wasted. If there’s a physical retail store and thousands of people are omingin everyday but you have no staff to even greet them or to make an offer. And that’s what a lot of people are doing with their content, they’re just letting these people come in and talk to them about a topic, and then these people search for a competitor’s post to learn how to do that topic. So the content has to be good and it also has to have a call to action. Because without that you’re wasting a lot of that traffic. If that makes sense. Rich: No, it absolutely does. I mean you can have a coffee shop with free Wi-Fi to bring people in, but if you’re not actually selling coffee, there’s really no point in having hat shop in the first place. Daniel: Exactly. So we always make offerings that are hypersensitive to one article. So let’s say that someone came and they wanted to learn about how to get started and build a Twitter account. That opt-in offer could be a quick video showing all the stuff we just wrote about in a 2-minute video on how to do it. So it’s much easier, you can stop, pause, and play, and set up your account. So that will be really appealing to someone who just read that article all about it. And now a small business owner knows how to setup a Twitter account. Because of that my lowest opt-in rate is around 17%, and my highest is 85% of my content. So it means that I can get less traffic on there, but much higher conversions, which means higher sales on the backend. That’s really important because if you are going to do organic traffic or paid traffic, if that asset doesn’t convert or is converting really low, it’s going to directly affect how much you can spend on ads and things like that. Rich: Makes sense. So we’re improving our articles and we’ve got some strong call to action that’s tied into the content that the person came to our website in the first place for. Daniel: Totally. And again, it’s quite the topic to talk about, it’s simple but it’s one of those things you’ve got to go in depth about. So I have two guides on those. So you’ve got a piece of content and it’s converting. So now you can actually promote it. The reason I talk about paid ads, and especially on Facebook, is it’s very simple to set up, it’s easy to get started, it’s also really easy to go out to a cold audience – like a blue ocean audience – and attract them to your content who never heard of you. Google Adwords and things like that which are great, but you’re advertising for specific keyword searches and there’s a huge segment of your audience who are not even searching for those keywords yet. They are a step removed. And so you can get in front of those guys with your content. But a big part of this, the big thing I see that stops people running paid ads and promotion, is they don’t know their numbers so they don’t know what they can afford. They don’t know what a customer is worth, they don’t know what a visitor is worth, or a subscriber. So that gives a lot of anxiety. You don’t know if an ad is working or if an ad is failing. For example my local gym, I helped them with some Facebook ads recently and they were getting new members for $17, but 10% of those people were signing up for a $2,000 yearly pass. BUt they didn’t know their numbers and they didn’t know the math on it. So they stopped the ads, when in reality they made $16,000 for the first $1,000 spent. So you have to know these things. And it’s not that difficult, it’s one thing minus the other thing is that number. And you have to stop me if I go off on tangents because it’s early morning here so I’m three coffees deep. Rich: No, that totally makes sense. And I agree, because one of the things as a digital agency owner that I always run into is I’ll ask people what is the customer lifetime value, and they have absolutely no idea. And so I think it’s really important that if we want to succeed, especially advertising which is so easy to measure, is that we only know if we’re winning or we’re losing if we know exactly what we can afford to spend to get that customer. Daniel: And it’s such a breakthrough, you won’t believe how much better you’ll feel about your business once you know these things. And again, it’s not that complex to figure out. You figure out your average order value, how many times they purchase , you’ve got customer lifetime value. For example we were speaking to a surf shop and they were saying people often come in and buy a tshirt or wax, which is $5 or $40. But the thing is, the average surfer will buy 5 surfboards at $2,000 a piece. So that person is actually worth $10,000 over their lifetime. So you’ve got to be measuring against the right things to actually implement and bring people in. Daniel: Another thing that people don’t realize. So if you know those numbers than you can get margins and goal posts. So in our business, like I was saying, we bring people to content, content converts to email, and then we make offers. We do that because it’s so easy to then get offers in front of them via email, they’re also 40% more likely to buy because they said yes to opting in, so know they’re more likely and they trust us. So that’s why we build our business around that. But also because I know that 1 out of every 100 email subscribers from my business will be a sale. If I know how much a sale is worth, then I know how much a subscriber is worth, and I know how much I can be running ads for as long as the leads are less than x amount I can keep running and running and running. Rich: Alright, so we know what our customer lifetime value is, we know what we can afford to spend on all this. But I’m sure some people are listening and they’re like, optimizing my site for the search engines is free, why not just wait for search engine optimization to take effect? Why are you jumping into spending money on Facebook? Daniel: Well this is the thing, I’m not against SEO. In fact, we do a lot of different promotion methods; influence, outreach, links, all these kinds of things. But I just want to give an example. So I just wrote this article and it took me a week to write and it’s 30,000 words. It’s a huge post. Rich: That’s half a book! Daniel: Yeah. A lot of books that you see out there are only 28,000 words, like some marketing books. So I could sell this thing. It would be crazy for me not to promote this. Also, I know if we can rank on page one for our keywords, it’s worth about $200,000 to my business based off of how much traffic would come to in via organic, conversion rates, sales, stuff like that. So I would be mad not to build links to it. But the thing is, we are building links to it. In fact, we’ve built 125 unique linking website to this. Which is way above what we need to get to the #1 position. But Google right now only recognizes 30 of them. And it might be another 3 months before they recognize 50 of them or 100. So it could be 6 months down the line before the SEO traffic actually starts to kick in. So it makes no sense to me not to be also pushing out and getting that content out there in the meantime, especially if I can do it at a profit. So I think there has to be a combination. There’s a disconnect between inbound marketers, who are usually classically introverted and they want people to come to them. They want 3 SEO rankings and things like that. When you have outbound guys who are super aggressive or cold call anyone, but they don’t create assets. What you need is a bit of a blend of the two. You need to be creating those assets, those inbound pieces of content because you can talk to so many people than you can. But you need to be putting it out there, especially with so much competition nowadays. There’s like 85 million posts written on a WordPress alone per month. You have to get that content out there. It’s not just that, but it’s also if you’ve worked in your business for awhile you know there’s certain conversations that you have again and again and again for someone to become a customer. So if you write content about that, well for one, you won’t have to have that conversation again. But for two, it makes sense to just go out and put that content in front of people who don’t know you, and have those conversations with more people and bring more customers in, rather than just creating new content for the customer you already have. I’m all about the smart lazy. Rich: Yeah, and that makes sense. And the bottom line is some of that Facebook ad traffic could be coming from other bloggers who will ultimately want to read that and link to it too. So you’re just getting it in front of a bigger audience. Daniel: Totally. You can even target other bloggers and things if you wanted to. Rich: Right. So we talked about SEO is great for that long term value. Facebook ads, specifically, are great for that short term win. But have you found that online ads start working immediately, are you getting success right out of the gates with them? Daniel: No. This is a thing that most people don’t realize, most ads start at a loss, and no one really talks about this. Anda lot of the information out there about paid ads, there also for big, big companies. So if you spend $4 and you’ve got a good process, you may make $1 back. So if you know your numbers and what you can afford to spend. Let’s say you can afford to spend $5 per email subscriber and they were costng $20, not great. But the way we find a winning ad is we test different elements and each time we find an improvement that improves the click through rate, which lowers the price, which improves the sales and opt-ins, and things like that. At one point my ads were costing me $9 per opt-in, and as of yesterday they were costing me $0.51. I can actually afford to spend $23 per opt-in. So learning how to do these things and how to scale it up is so powerful. But again, a lot of people don’t really talk about this, or talk about testing methods where you’ve got to spend $1,000 on testing, and all of a sudden you don’t have a budget to run ads anymore. So a lot of the things that I write are more about small businesses who are possibly time poor, so you can start testing an ad for $5 a day, and as you’re going through that it’s not breaking the bank and you can start to see improvements where now it’s $3 and $1 back. And then it’s $2 and $1 back. And then you get to that point where it’s $1 and $2 back. Rich: And you’re doing this by continually A/B split testing, maybe first testing an image, find the image that works better, and then going to work on the headline, and then going to work on the description. Is that basically the process you’re taking here? Daniel: Totally. So there’s two types of testing. A/B testing is basically where we’re testing specific elements and doing variations to find the winner. So the first thing that stops people in their tracks with a Facebook ad is the image. So it’s the most important thing to improve that first because that’s going to stop them and potentially get clicks. So I would only run like 4 images and leave the rest of the ad totally the same. And what I’ll find is one of those images gets more clicks, I’ll keep that and call it the control, and then I will test the headline. Because what happens when someone stops in their tracks on an image is they’re actually looking at the headline to see is this for me. Because if we can’t get them to do that, then they’re not going to look at the rest of the ad, they’re not going to click across, they’re not going to come across to the piece of the content. So basically we test these different elements to get that winning ad. And I do them one at a time because it’s low budget and I can just scale up. Multivariate testing is where you test every possible connotation. So you’ve got all four images, a four headlines, all four copy, but it means that you’re running 52 ads at once. The problem with that is you need about 10,000 views on each possible variation to get statistical significance. Basically, mathematically is it true that this one is outperforming the other. Because sometimes it does outperform but it’s only had 100 views, once it gets to 1,000 and suddenly the other ad pulls ahead, it goes like this. So if you were running 52 ads and you need 10,000 views on each, that’s probably your entire marketing budget for like a month, if you have a small business. And so again a lot of the information out there isn’t really tailored to people who are time poor, whereas you can actually get going and set up an effort for such a small budget early on. Just $5 a day, find a winning image, you let it run for a couple of days, then you find a winning headline and you let that run for a couple of days, and get to that point. So they all start at a loss, the trick is to be sending enough money to get enough data to find a winning element. Because then you can scale up. I think we’ve got 175 email subscribers from paid ads just last week, and they cost us $.50 each. Rich: So talk to me a little bit about the benefits of starting narrow with our advertising and then going broad. Daniel: So this is a testing system that we use. A big thing that stops people from finding a winning ad is they are too specific with their targeting. So if you think of supply and demand, the more specific we are, the more Facebook is going to charge to actually show our ad to people. So let’s say we had an article about content marketing and it was about Google RankBrain, perhaps. So I could target content marketers in a certain country, in a certain area, who read SEO blogs who are interested. Great, they’re going to be the perfect audience. But the cost is going to go up every time we get more specific. Now that’s not a bad thing in the testing phase, because it’s very easy to create an ad that gets a lot of clicks from the wrong people. That’s why clickbait headlines work so well, they get a lot of clicks but they’re not going to buy anything. I remember I was listening to an older episode and you were saying you wrote an article about where to eat in Portland because it was for your guests and things, but those people are not going to buy. It’s the same with ads. We could have an ad variation where it always gets clicks, but it gets clicks from the wrong people. So what I would do early on is I would create a really specific audience of maybe 1,000 – 10,000 people who are ideal for my article so I can test every variation and get the highest clicks from those people. It’s going to cost way more than if I was running the ad. So it’s going to cost more because of the specificity of that ad. The thing is, a lot of people stay there and they can’t get their ad to convert. What you do is once you’ve got the best performing ad, you go broad. You tell Facebook I just want to target content marketers in America and suddenly it’s a million people. What happens is Facebook uses a machine learning algorithm, so it starts to track data points to people that interact with your ad. Now because your ad was designed and tested with the ideal audience, guess who’s going to convert? Eventually it’s going to start being those people who are the idealerson we wanted. Facebook starts to recognize that and says, hey, these are content marketers that are interested in SEO that are interested in this. And so it starts to narrow down and target them on its own but without charging you more for it. And so the relevance of the ad goes up, the cost goes even lower, it starts sharing it even more, it’s interacting. So you have to test narrow to find the winning elements, and then from there go broad and let the algorithm actually do it’s magic and find those people for you and lower your costs. And again, I apologize, I’m three coffees deep. Rich: No, no, it makes a lot of sense. A couple follow up questions. So we’ve been talking strictly about Facebook advertising. Are you doing any Google ads as well? Rich: You’re not doing any. So this is all about Facebook. And are you creating…I mean you’ve talked about specific audiences about you or your clients, are you also doing retargeting and setting up an audience who have already visited your website? Daniel: I am a little bit. So I have a second blog called Inbound Ascension, it’s all about retargeting. So one site is all about leveraging content and traffic, the other one is about converting people who are already there. It’s just making those elements more efficient. It’s kind of on hold right now while we get amped to a certain traffic. I am retargeting, but not for what you may think. Targeting people who have read the article and didn’t opt-in. And I am retargeting them with an offer to opt-in. And what we’re seeing is around 20% of the people who didn’t opt-in the first time come back and opt-in again. So I’m leveraging the traffic that we’re getting and making it more effective. Rich: Interesting. So you’re not showing them another article or something like that, you’re just literally saying I know you enjoy this content, why don’t you sign up for our email newsletter. Daniel: Exactly. And usually I have a specific offer in a piece of content, and my call to action when I target them is this is for the same offer. So I wrote in detail about this, we call it The Candy Bar Conundrum. So you know when you’re walking around the supermarket and there’s always temptations and things as you’re walking around, and it’s slowing sapping willpower as you walk up and down the aisle. And you get to the end to buy and there’s these candy bars at the counter. They have them there 1) to increase average sale value, but, 2) you’re really susceptible to buying those things at that point. Now some people will come and not opt-in at all, even though they might be interested, maybe they left. So by retargeting them with the offer it makes sense, and they’re like, “Oh yeah, I was reading that thing and I want to come back and get that.” Some offers we’re reading and didn’t opt-in at the time, the thing is, when we’re on Facebook our defenses are down and we’re on autopilot. It’s very easy to actually convert people who said ‘no’ before because our willpower is very low. So that’s why we’re seeing a 20% increase in people who said ‘no’, who then come back and say ‘yes’. Daniel: So there’s a strategy behind it. Rich: I haven’t heard anybody else doing that, so that’s pretty cool. Daniel: Yeah, so that’s why we get such high opt-ins with our content. I’m not pushing them to something new because I don’t need to. I have an asset that already does the job. I don’t want to get into too much stuff, but say I have a content sequence like a content funnel, that takes top to middle to bottom to get them a customer. I can also run retargeting ads to say, “You read that article, here’s the next one in the series”, stuff like that. Rich: Yeah, continue down the sales funnel. Daniel: Exactly. And I normally email people about the content anyway. But Salesforce did this study where they found that if they also retargeted about that piece of content with an email, they’d see like a 30% lift in people that actually clicked, rather than people who just saw an email alone. So you can actually continue to usht them through and build the ideal customer, if that makes sense. I also use retargeting for ads. So we have a content training academy where we teach people to write and promote content, so we’ll retarget ads there because then it’s like, do you want this that’s closing at x time, here are some case studies. Just to add an element of why certain people don’t buy and meet those criteria. But on the content side of things, it’s more important to me that someone who came to an article they clearly showed interest to, take the ideal action to opt-in, and then from that I can then push them further along. Rich: Good stuff. Daniel, I really appreciate this. I’m sure people want to check out some of those course, your website, where can we find you online? Daniel: So everything we have right now is at ampmycontent.com. We have this huge article about running paid traffic that runs you all the way through. and that’s at ampmycontent.com/promoted-content. All that stuff we were talking about improving email opt-ins, taking a piece of content and improving it, it’s all on there. If you want to follow me on social I’m actually quite hard to get hold of. I’m a big fan of Cal Newport’s book, Deep Work, and I don’t have a phone on or connections and stuff, but you can find me on Twitter at @inboundascend, but it’s usually like I might share a post once every three months. But it’s usually, “I’ve listened to Flock of Seagulls today which has me in the writing mood”, or something like that. We’re not big on social, which I know is ironic in this day and age. Rich: Totally makes sense. Daniel, thank you very much for stopping by. I appreciate your time and your expertise. Daniel: Thank you so much for having me, I hope it was valuable for everyone listening. Daniel Daines-Hutt has perfected the art of creating excellent content that excels at both the search engines and in conversion. Check out both his website and his blog to learn how he teaches businesses to create and improve their content.